Museum d'Alfonsino is a multiplayer stage in Splatoon. It takes place in the courtyard of an art museum. The defining feature of Museum d'Alfonsino is five rotating platforms, which are central to navigating the stage. Museum d'Alfonsino is a stage that features five rotating displays, which are central to navigation, as well as reaching vantage points. The spawn point of the stage is at a courtyard entrance, with a path to the left leading towards a large rotating display, and a path to the right leading to the center of the stage. Directly in front of the spawn is a small rotating platform with four spokes that spins counter-clockwise without stopping. Continuing to move forwards will lead to large displays with three spokes, that rotate one-third of the way before stopping for five seconds. When stopped, they align perfectly with the rotating platform in the center of the stage. The large displays are entirely inkable, allowing for players to climb up and reach grated platforms on the right side of their walls. The center of the stage is located to the right of these platforms, relative to the spawn. In the center of the stage is a lower area, with a rotating display with four spokes in the middle. It rotates counter-clockwise one-fourth of the way before stopping, aligning with the large displays. To the left and right of the center-stage are lowered areas with statues, where most of the battling in the stage takes place. The sides of the stage contain large pools of water, which players must look out for when jumping from the left side-route to one of the large rotating displays. In Turf War, the final score is determined by where the rotating platforms stop at the end of the match. In Splat Zones and Tower Control, the spawn points for both teams have been moved to the first rotating display. The Splat Zone is located in the center of the map. Inking the rotating display does not count towards capturing the zone. Many platforms and one statue have been added near the center, and the central display has been shortened to make jumping on it from both sides easier. The tower in this mode, is located at the center of the map, replacing the central display. The goal is found right outside the enemy's spawn, after going through the giant display. 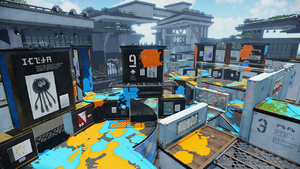 The wall sticking out on both giant displays have been removed, and many blocks and barriers have been added, including the platforms from Splat Zones. When the tower is occupied, it will first go straight and go around the outside of the Giant Display over water. It then turns left and heads for the goal. The Rainmaker starts on top of the shortened central display. The goal is located on the rotating display in the enemy team's spawn. The giant displays have been altered a bit: they both have one section removed and they now rotate one-third counter clockwise, then one-third clockwise, never stopping with the removed side towards the middle. Several boxes have been added to create additional ways of reaching the opposing team's base, and a small section left of each team's spawn has been blocked off. Museum d'Alfonsino was released November 14 at 02:00 UTC after being leaked on the SplatNet stage schedule on the 12th and formally announced in the Nintendo Direct later that day. Adjustments made to prevent players from taking certain shortcuts in Rainmaker mode. Fixed the issue in modes other than Tower Control in which the area around the central rotating platform was registering as being inked in unintended ways. Picture of the first leaked stage schedule that appeared on SplatNet on 12 November 2015. Japanese promo of Inklings at Museum d'Alfonsino. An Inkling swinging an Octobrush. An Inkling jumping onto a revolving platform. Another Inkling standing in front of one of the revolving platforms. A sign on the wall. Museum d'Alfonsino during a Splatfest. Promo for Krak-On at Museum d'Alfonsino. A female Inkling wearing, ironically, a swimsuit. Young Inklings having a feast. An Inkling-like creature with a nudibranch on a leash. A jellyfish and some miscellaneous art. A similar jellyfish and some more art. A statue of a female Inkling in The Thinker pose. Two squid fountains and the Takoroka logo in the background. The Alfonsino is a type of deepwater fish that inhabits temperate and tropical oceans. Museum d'Alfonsino is the first stage to change the location of both teams' spawn points depending on the game mode. On the ground near the giant rotating displays is an embezzled giant squid. It is difficult to see, but can be revealed with ink. One of the statues is an Inkling sporting the same pose as Auguste Rodin's famous sculpture, The Thinker. Near one of the rotating platforms are paintings of soup cans, a reference to famous artist Andy Warhol, who is famous for his paintings of Campbell's soup cans. There's an Inkling version of Sharaku's most famous piece, Otani Oniji III as Yakko Edobei. An Inkling version of Leonardo da Vinci's famous artwork, the Mona Lisa, can be seen near the center of the stage. A painting similar to Vincent van Gogh's Starry Night is displayed inside the museum. There is a large statue of a Super Sea Snail near each team's base. The Squid Sisters' quote, “Ahhhh! I just love art!” | “Art schmart. I wish this was a science museum.” is a reference to the fifth North American Splatfest, for which the theme was "Which is more important? Art or science?" A large statue of the Takoroka logo can be seen in the background of one of the team's base. Jellyfish can be seen performing various tasks in inaccessible parts of the museum, such as painting and sculpting. In the final few seconds of a match, a closing jingle can be heard. When Museum d'Alfonsino is playable during Splatfests, two recordings of childlike laughter can be heard periodically. The reason for these sounds' existence is unknown, similar to the distant screaming that can be heard during Octo Valley boss battles. The internal codename for this stage in the game files is "Pivot". Kinmedai Bijutsukan Splendid Alfonsino Art Museum; Kinmedai is also a pun on "近代" (kindai), which means modern (time or art). German Pinakoithek Pun of Pinakothek (art gallery) and Koi, a group of fish. Italian Museo di Cefalò Cefalopode is Italian for Cephalopod, and Cefalò is a shorter version to make it sound like a personal name. Spanish (NOE) Museo del Pargo Pargo means red porgy. It's also a pun on Museo del Prado, the most important museum in Spain, ubicated in Madrid. ↑ A YouTube video of the mysterious sounds.